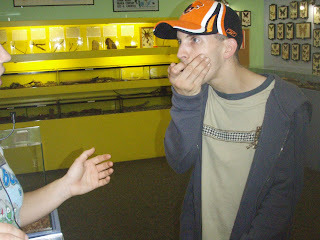 Evolution and Diversity: Everyone Should Go Visit the Bug Zoo! Everyone Should Go Visit the Bug Zoo! The Bug Zoo is located at 631 Courtney Street in Victoria BC. I have already visited the bug zoo a couple times this year, and it never fails to amaze me. There is an incredible array of arthropods, including spiders, insects, scorpions, and myriapods ( millipedes and centipedes). 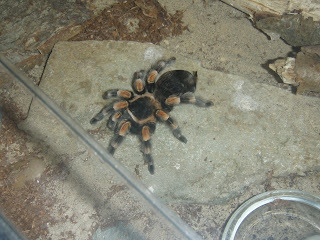 The Bug Zoo is very reasonably priced, and there are special rates for students. I highly recommend visiting the zoo. For those of you who can't make it I am going to share some of the pictures I took while I was at the zoo, and talk about each of them. 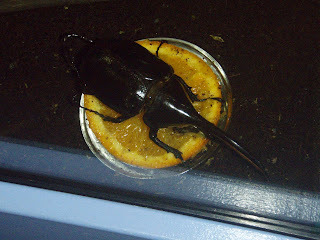 This is a Hercules Beetle. It spends a large portion of its lifecycle as a larva. "A larva is a sexually immature form of an animal that is morphologically distinct from the adult stage, usually eats different food, and may even have a different habitat than the adult... Animal larvae eventually undergo metamorphosis, a resurgence of development that transforms the animal into an adult. (Campbell N.A., Reece J. B., 2005)." The larva tunnel through wood, eating rotting wood as they go. The adults get there nutrition from decaying fruit, as you can see in the picture here. This is one of my favourite insects! 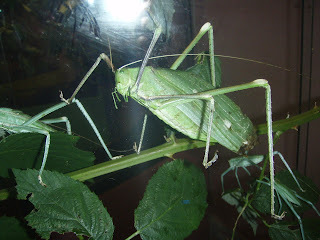 It is the praying mantis and belongs to the order Mantodea. They use their color to camouflage into their surroundings. This may help while hunting prey, and may also be benificial from hiding from preditors. Males beware before heading too close to the cage though, the females like to devour their partners after mating. 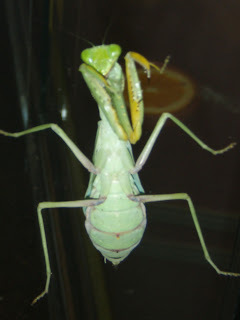 First the female bites off the head of the male while they are still mating, then she begins on the rest of the body. The wings are the only evidence that there had once been a male in the cage. No these aren't sticks! 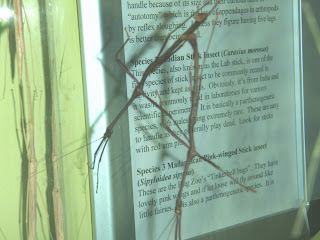 These are actually stick insects. It is incredible how much they look like their surroundings. Natural selection has caused them to develop stick like features that aid in their survival. They have even developed stick like tendencies! They sway in the wind, hang around with other branches and leaves, and even have a plant-like smell (although this could be attributed to their diet)! 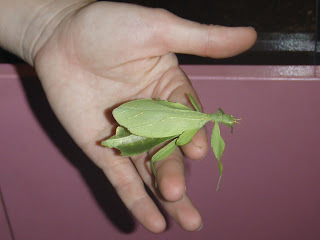 This is a leaf insect. As you can see it very convincingly looks like a leaf. This camouflage provides a great deal of protection from its own predators, but sometimes other bugs and animals will accidentally mistake it for leaf and take a bite out of it. Ouch! As the leaf bugs age, they also get yellow spots, turn brown, and develop jagged edges, making them look less tasty to animals and other neighboring bugs that may have mistaken them for a meal earlier on in their lives. You'll never guess which insect this guy is kissing. A COCKROACHE!!! I know most of you said "Ew," but Cochroaches are actually very clean when it comes to bugs. They are constantly cleaning and grooming themselves. There are approximately 4,000 species of Cochroaches. Something interesting about them is that Cochroaches, like other insects, do not have a centralized brain that controls their entire body, instead they have clumps of nerves called ganglia that carry out functions. In the coachroache has 3 ganglia in the front of the head to form the brain, and 3 in the back of the head that control the mouth and the antenna. There are 11 more ganglia distributed throughout the body of the cochroach, 3 in the thorax, and eight in the abdomen. These ganglia control the roach's legs, wings and other body parts. Because all of the ganglia operate independently of one another they are still able to carry out their functions even if say the head is removed from the abdomen, until oxygen or nutrients stops the ganglia from functioning. Campbell, N. A., & Reece, J. B. (2005). Biology seventh edition. An introducduction to animal diversity ( pp. 627). San Fransisco: Benjamin Cummings.